Over the years, from when I was just shy of being a teenager to some point in college, the comedies of John Hughes were a recurring stable on a basic cable channel. During that period, while more consumed with action-based antics involving caped crusaders, lightsabers, and ninja turtles, my TV surfing during breaks from those things would routinely stop on that channel upon seeing a spacious library with a group of teenagers settled or settling in for detention. Their language and lingo were observably different than mine, my personality never lined up seamlessly with any of the characters, and the absence of action probably should've driven my attention toward something else … but it didn't. Something drew my attention to the individual facets of each of the teenagers involved in The Breakfast Club, even at a young age, and I found myself identifying with different details of each student -- seeing bits of myself in each -- as the complicated years of adolescence went by and I routinely stopped on the channel to watch it again, seeing if I've taken on a new trait while growing up. If others are like me, this experience changes a bit as one gets older and moves beyond the ages of the students stuck in detention at Shermer High School on that Saturday morning. Adults begin to settle into the personalities that they've become, and a change happens in how the cluster of five students are viewed as they plop down in their chairs and get ready for, essentially, a work day's amount of sitting around and doing nothing outside of a required essay, contemplating the negative impacts of their actions. 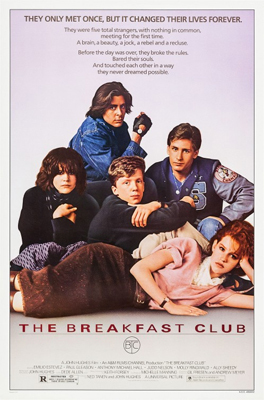 Instead, reminiscence takes over as one watches a brain (Anthony Michael Hall), an athlete (Emilio Estevez), a basket case (Ally Sheedy), a princess (Molly Ringwald), and a criminal (Judd Nelson) start to interact with one another, outside the earshot and visible range of vice-principal Vernon (Paul Gleason). The camaraderie and clashes between these divided personality types that speak directly to high-school aged people becomes a representation of past growing pains: a reflection of how individuals mature and develop awareness of others. With time, it becomes a reminder, both of what's been overcome and what kids of that age go through to reach adulthood. In terms of how the plot develops, not a lot happens in The Breakfast Club, similarly to the amount of stuff that happens in detention itself. The premise anchors the characters to a single location for eight hours, and the barest of movement, even between nearby desk chairs, is observed as something significant in the story, let alone if they find a way of sneaking out of their Saturday imprisonment for whatever reason. Instead, the film's interest arises once the characters start to disclose more about themselves, at first hesitantly and later with the compulsion to reveal what they're hiding underneath … the versions of themselves that don't conform to their labels. John Hughes smartly plays with stereotypes and personality types once their guards are lowered, and they're able -- and, to different degrees, willing -- to see one another for who they really are, hinged on topics from sexual activity, parties, and drugs to how their parents treat them and where they're headed. In a school environment, it can be hard to look beyond base evaluations of people, and breaking through that to see nuanced individuals is a big part of growing up. By Hughes' design, each character strongly projects their individual stereotypes at first, exaggerated for effect both on a cinematic level and, in a way, on a meta level. By having the characters represented as such clear-cut depictions of who they're pigeon-holed into being, it makes the process of breaking down their barriers more apparent and humorous, eventually transforming into starker before-after contrasts than if they had been presented as multi-layered characters from the get-go. Their rigid embodiment of the stereotypes are also easy to stomach since people, both young and old, can fall into the trappings of their social labels, making it easy for rich princesses to feel comfortable eating sushi at a detention lunch and for ostracized weirdos to feel comfortable shaking dandruff onto a landscape illustration to create "snow". Also, writer/director Hughes takes into consideration the inherent compulsion of people to evaluate others based on impressions and outward appearances, how they're summarized through inference and labeling, a real-world experience worked into his teen comedy by prompting the audience -- whether they want to or not -- to see and find amusement in the surface before going deeper. Eventually, of course, it's revealed that more -- perhaps not much more, but more -- lies under those surfaces of the five teenagers than initially led on, and it's seeing how similarities and kinships form despite their differences that keeps The Breakfast Club so relevant over time. Even though he's the most volatile and obnoxious by a wide margin, Judd Nelson's John Bender also becomes the catalyst for the rest to break the rules, speak up, and genuinely communicate with one another, and the sparks of his wounded, closeted personality underneath the gruff surface earn him genuine sympathy while rubbing his detention mates the wrong way. Bender's the focal point, and the rest eventually feel disarmed enough by his brazen attitude to come out of their own shells, to which the credible performances from all involved expose the pressures that each of their characters deal with behind the scenes: the necessity of earning college scholarships based on consistent performance; the complications of popularity, both gaining and maintaining it or not caring about it; and the complicated relationships they share with their parents. Something unexpected popped up this latest time of watching The Breakfast Club, though, hinged on a flicker of a moment featuring vice-principal Vernon. 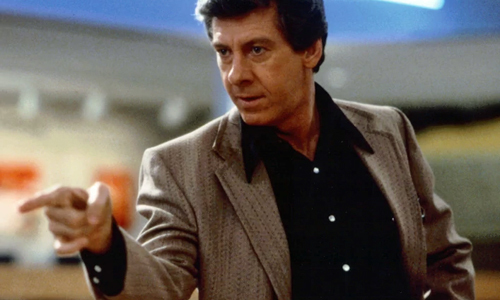 From the beginning, he's framed as the overbearing and control-hungry villain through his generally unpleasant demeanor, delivered with amusing sternness in a way only Paul Gleason could've done. Yet, there's a key moment after one of his intense, dramatically potent outbursts of scolding that the point-of-view catches a look at him exhaling, closing his eyes, and shaking off visible stress: a piece of the iconic "cracking skulls" scene that gets overlooked (or, in clips, cut off). In one's younger years of unanimously siding with the teenagers, that moment might be viewed as just a breath following a tense moment. Older viewers might pick up on more from that expression, though, in which the trickiness of correctly handling problem kids -- the responsibility of slightly influencing that generation's youth -- clearly weighs on him. He's still an unmistakable jerk, indisputably revealed in later interactions, but there's a glimmer of sympathy felt for his position there. That's one of the more remarkable aspects of The Breakfast Club: while impressions of John Hughes' cautious, considerate mix of exaggerated and nuanced characterization may change with time, they don't seem to get outright replaced by cynicism or frustration with the detention-goers. In the growingly complex world of adulthood, the urge might come up for some individuals to look at most of their concerns with world-weary eyes and deem them as overblown, as facets of youth that'll be conquered as they approach the true trials of the post-high-school existence. Hughes' craftsmanship holds the ability to sidestep those inclinations, perhaps even serving as a reminder to not engage in that kind of stereotyping in the adult world, all the while grasping onto the idea that the concerns of youth and how they'll conquer them, both trivial and momentous, are indeed significant and will shape how they'll handle the challenges in the years to come. Watching The Breakfast Club over a matter of decades has become an exercise in evolving personal outlooks and appreciation, making it hard to forget about it.